Pivot Tables allow you to easily summarize, analyze and present large amounts of data. However, to appropriately do this, you must be able to organize the data into adequately-sized and organized subsets. The grouping and ungrouping features of Pivot Tables allow you to easily do this. Knowing how to quickly group data within a PivotTable report can help you immensely. This is because it allows you easily group a huge amount of disparate data into a few groups or subsets. Fewer groups allow you to simplify your analysis and focus on the (grouped) Items that matter the most. One of the most useful features of a pivot table is the ability to combine items into groups. This Pivot Table Tutorial explains all the details you need to know to group and ungroup data in a Pivot Table. I focus on showing how you can easily group different types of Fields in different circumstances. You can also find a thorough explanation of how to ungroup data. Finally, I explain how to solve some of the most common problems and challenges you may encounter when trying to group Pivot Table data. The following table of contents lists the main contents I cover in the blog post below. This Pivot Tutorial is accompanied by an Excel workbook example. If you want to follow each step of the way and see the results of the processes I explain below, you can get immediate free access to this workbook by subscribing to the Power Spreadsheets Newsletter. I use the following source data for all the examples within this Pivot Table Tutorial. This is similar to the data in other Pivot Table Tutorials, such as this one. Date: Between January 1 of 2017 and December 31 of 2019. Units Sold: Between 1 and 5 per entry. Not all Fields are suitable for automatic grouping. If you're working with Excel 2016, there's an additional grouping feature you can use: automatic date and time column grouping. Pivot Table grouping is quite flexible. It allows you to group several different types of Fields. You can create many groups and you can group previously existing groups (create groups of groups). Even though this Pivot Table Tutorial doesn't focus on Online Analytical Processing (OLAP) sources, there are certain important restrictions/issues to consider. I provide some more comments about these in an individual section below. In the following sections, I provide a detailed explanation of each of the different ways of grouping data in a Pivot Table. In Excel 2016, Microsoft introduced the time grouping feature. Time grouping is generally triggered when you add a date or time Field to either the Rows or Columns Areas of a Pivot Table report. Excel automatically detects relationships across the Field. If your data spans a short period within one month, AutoGroup does not take any action. If your data spans several months but does not fall outside of one year, AutoGroup groups to months. Excel adds calculated columns or rows to group the Field data. The data is automatically arranged so that the highest-level date or time period is displayed first. The data is generally collapsed. The above may sound difficult. Don't worry. The example below shows how this looks in practice. Add a date or time Field to the Rows or Columns Areas of the Pivot Table. Assume you have the following PivotTable report based on the example source data I explain above. It displays the Sum of Units Sold and Sum of Sales Amount for each item. No information from the Date Field is displayed because the Field isn't yet in any Area. You can both (i) add the Date Field to the Rows or Columns Area, and (ii) automatically group the Date Field in a single step. In this case, I add the Date Field to the Columns Area. The resulting Pivot Table report looks as follows. Notice that, in this case, Excel displays the data at the higher-level date. In this case, that's years. Adds the following 3 columns to the Rows Area: Years, Quarters and Date. Organizes the added columns in such a way that the highest-level date period is displayed first. Years appears before Quarters. Quarters is before Date. Instead of displaying individual days, Excel displays the data at the month level. If you're working with data model Pivot Tables, consider the following restriction explained at office.com: If you drag a date Field that has more than 1,000 rows of data from the Field List to a Pivot Table Area, the Field is removed from the Field List. This allows Excel to display a Pivot Table overriding the 1 million records limitation. If you automatically group Fields with time grouping, Excel assigns default names and labels to the newly created Fields and groups. I explain how you can modify either of these in a separate section below. You can take advantage of the time grouping feature even if you've already added date or time Fields to the same Area. Is already included in the Rows Area. Displays individual days (isn't grouped). Add the date or time Field to the relevant Area of the Pivot Table. As an example, I add the Date Field to the Rows Area of the Pivot Table report above. Adds new columns to the Pivot Table. Organizes the columns so that the highest-level period is displayed first. Collapses the data in the Date Field. The Date Field shows months instead of individual days. If you're working with version of Excel prior to 2016, you won't have access to the time grouping feature I explain in the previous section. Even if you can use time grouping, there are cases where this feature won't be the right tool your job. Therefore, in this section, I explain the general process for automatic Field grouping. Right-click on a Field that is suitable for automatic grouping. Excel displays a contextual menu. Excel displays the Grouping dialog box. Specify the grouping conditions in the Grouping dialog box. Select the Field you want to group automatically. Go to Ribbon > Analyze > Group Selection, Ribbon > Analyze > Group Field, or use keyboard shortcuts (“Shift + Alt + Right Arrow”, “Alt, JT, K”, “Alt, JT, R” or “(Shift + F10), G”). Use the Grouping dialog to specify grouping conditions. Report #1: Group the Date Field by months, quarters and years. Report #2: Group the Unit Price Field in $1,000 intervals. As I explain above, you can automatically group Pivot Table items in different ways. In the following sections, I look at the process of automatically grouping Pivot Table Items by using a contextual menu. The Unit Price Field in Report #2. After your right-click on a Pivot Table Field suitable for automatic grouping, Excel displays a contextual menu. In the contextual menu that Excel displays, select Group. Starting at: Smallest number (for numeric Fields) or first date/time (for date/time Fields) to group by. Ending at: Largest number (for numeric Fields) or last date/time (for date/time Fields) to group by. The value you enter in the Starting at input field (#1 above) must be smaller (for numeric Fields) or earlier (for date/time Fields) than the value you choose for Ending at. Numeric Fields: Number that represents the group's interval size. This type of grouping is commonly used for frequency distributions. Date or Time Fields: Select 1 or more of the time periods listed by Excel. You can usually select more than 1 time period for grouping. Number of days: This field is active if you work with date/time Fields and choose to group by days in the By field (#3 above). This allows you to group date Fields by a certain number of days. If you group dates by a certain number days and use the Number of days field (#4 above), you can't group by other time periods (months, quarters, years) at the same time. I explain how to get around this restriction in a separate section below. You can use the process I explain there to, for example, group by (i) weeks and (ii) months, quarters or years. Starting at: January 1, 2017 (1/1/2017). Ending at: January 1, 2020 (1/1/2020). Ending at: 3,000 (enter without the comma: 3000). By: 1,000 (enter without the comma: 1000. To confirm your grouping settings, click on the OK button in the lower section of the Grouping dialog box or press the Enter key. Excel groups the Fields accordingly (I show this below). In this section, I look at a second way to automatically group Pivot Table Items. In this case, you work with the Ribbon. This step is substantially the same as step #1 I describe above for automatically grouping Pivot Table Items through a contextual menu. The difference is that, instead of right-clicking on the Field, you select it. The Field must generally be a date/time or numeric Field. Ribbon > Analyze > Group Selection. Ribbon > Analyze > Group Field. Shift + Alt + Right Arrow. This is the same as step #5 of the process to automatically group Pivot Table Items through a contextual menu (above). Number of days (if grouping by days). If you work with a date or time Field, the first and last date/time to group by. If you work with a numeric Field, the smallest and largest numbers to group by. Date/Time Field: By is a list box that allows you to select 1 or more of the time periods that Excel lists. Numeric Field: By is an input field where you can specify a number representing the grouping intervals. Element #4 (Number of days) applies when you group by days. You use it to specify the number of days used to group the data into. Report #1: My purposes is to group data in quarters and years. Report #2: My goal is to group the Unit Price Field in $1,000 intervals. After you enter the grouping conditions in the Grouping dialog, confirm your input by clicking on the OK button in the lower right corner of the dialog box. Report #2: Data is grouped in $1,000-per-unit price intervals. Excel assigns default names and labels to any newly created Fields or groups. You can easily modify either of these by following the processes that I explain further below. The process to automatically group by dates that I explain in the previous section covers most situations. However, as I explain above, you can't group by (i) a certain number of days, and (ii) the other grouping periods (months, quarters or years). A common situation where this restriction can be annoying is if you want to group by weeks (7 days) and months, quarters or years. Group the date Field, to the extent possible, using the automatic grouping process I describe above. Add helper column(s) to the source data. In each helper column, add a formula to calculate grouping levels/intervals. Expand the data source of your Pivot Table to include the helper column(s). The Pivot Table Field List displays the new Field(s) that correspond to the helper column(s) you added. Add the newly-added Field(s) to the Rows or Columns Areas. Once your data is grouped, to the extent possible, using Excel's grouping feature, go back to the source data. Add 1 or more helper column(s) to the source data. The purpose of this(these) helper column(s) is to help you calculate the levels or intervals of the additional group(s) you want to add to the Pivot Table. In the example we're working with, I add a single helper column. I label it “Weeks” and use it to calculate the week number. As I mention above, the purpose of the helper column(s) you add to the source data is to calculate the grouping levels/intervals you need. ISOWEEKNUM: Calculates the ISO week number for a date. Week 1 is the one containing the first Thursday of the year. WEEKNUM: Calculates the week number for a date. Generally, the week containing January 1 is week 1 of the year. MONTH: Calculates the month of a date. MONTH returns a number between 1 (January) and 12 (December). You can, therefore, nest MONTH within the TEXT Function to convert the number to a string. Date: A reference to the cell holding the date in the same row as the formula. 2: This argument (Return_type) specifies the date in which the week begins. 2 means that the week begins on Monday. You can specify that the week begins on Sunday by setting this argument to 1. Depending on your situation, you may have to manually expand the data source of the Pivot Table you're working with to include the helper column(s). Use the keyboard shortcuts “Alt + F5”, “Alt, A, R, R”, “Alt, JT, F, R” or “(Shift + F10), R”. Go to Ribbon > Data > Refresh All > Refresh. Go to Ribbon > Analyze > Refresh. Right-click on the Pivot Table and select “Refresh” within the contextual menu displayed by Excel. Go to the Change PivotTable Data Source dialog box. Adjust the reference to the source range within the Table/Range input field. Use the keyboard shortcut “Alt, JT, I, D”. Go to Ribbon > Analyze > Change Data Source. Within the Change PivotTable Data Source dialog, check the Table/Range input field. This field displays the source data range. Modify this specification to extend the data range and include the helper column(s). Before Modification: The range covered columns A to F.
After Modification: The range includes column G.
Once the data source range specification includes the helper column(s), click the OK button in the lower right side of the dialog box. This confirms the changes you've made. After completing the previous 4 steps, as required, Excel displays the newly added Field(s) to the Pivot Table Field List. This(These) Field(s) correspond to the helper column(s). Once Excel adds Field(s) to the Pivot Table Field List, you can work with them as usual. This includes moving them to the Rows or Columns Areas. You can complete the process of filtering by week, month, quarter and year by adding the Field(s) to the appropriate Area (Rows or Columns). In the example below, I add the newly-added Week Field at the bottom of the Rows Area. The resulting Pivot Table report groups items by week, month, quarter and year. The Field you want to group doesn't hold date/time nor numeric data. You want to group selected Items. Fortunately, you don't always have to rely on automatic Field grouping. Excel allows you to manually group selected Items. If you're working with Fields that are organized in levels, you're only allowed to group Items that are at the same level. Select the Items of the Pivot Table that you want to group. Select the Items you want to group. Go to Ribbon > Analyze > Group Selection or use a keyboard shortcut (“Shift + Alt + Right Arrow”, “Alt, JT, K” or “(Shift + F10), G”). Appears immediately within the Pivot Table Field List. Is based on the Field containing the grouped Items. Behaves like a regular Field. Let's go through each of the steps of the processes I explain above to understand how this works in practice. As I mention above, there are different ways to manually group Pivot Table Items. In this section, I explain the first process I describe above: how to group Pivot Table Items through a contextual menu. Contiguous Items: Maintain the Shift key pressed while selecting the Items. Non-Contiguous Items: Maintain the Ctrl key pressed while making your selection. Once you've selected the Items to group, right-click the selected Items. After you right click, Excel displays a contextual menu. Within the contextual menu that Excel displays, choose Group. Once you complete the simple 4-step process above, Excel groups the selected Items. This step is the same as the first step to manually group of Pivot Table Items through a contextual menu. As I explain above, you can select Items with the mouse or keyboard. Once you've selected the Items to group, go to Ribbon > Analyze > Group Selection. If you're working with Fields that aren't suitable for automatic grouping (as in this case) the Group Field button (Ribbon > Analyze > Group Selection) is greyed out. Alternatively, use the “Shift + Alt + Right Arrow”, “Alt, JT, K” or “(Shift + F10), G” keyboard shortcuts. After you complete this quick 2-step process, Excel groups the selected Items. Once you complete either of the processes to manually group Items I explain above (through contextual menu vs. Ribbon or keyboard shortcut), Excel creates a new Field (Item2 in the screenshot below). This new Field is based on the grouped Items. Thereafter, you can work with that new Field in the same way as with regular Fields. The new Field is based on the Item Field. Because of #1 above, the default name of the newly-created Field is “Item2”. The Items within the Item2 Field are, by default, labeled Group1 and Group2. The Item2 Field appears automatically in the Rows area of the Pivot Table. Strictly speaking, this completes the process of manually grouping Pivot Table Items. However, the default names that Excel assigns to the new Field and Items may not be the most meaningful. Let's look at how you can change these. The following sections also apply to automatic grouping and time grouping, which I explain in previous sections. There are several ways to change Pivot Table Field names. I explain some of these in this section. Excel displays the Field Settings dialog box. Enter the new Field name in the Custom Name Input field. Go to Ribbon > Analyze > Active Field. As an alternative, use the keyboard shortcut “Alt, JT, M”. Enter the new Field name and press Enter. Edit the Field name in the cell. In this section, I explain how you can change a Field name through a contextual menu. As an example, I use the following Pivot Table. 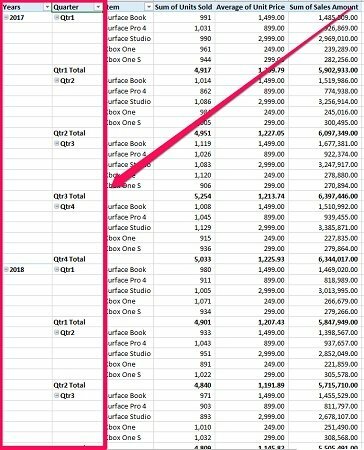 This is the Pivot Table report that I create in the section about time grouping in Excel 2016 (above). Notice that the Field containing months is labeled, by default, “Date”. Let's change this label to “Month”. To begin the process, right-click on the Field you want to change. As an alternative, use the keyboard shortcut “Shift + F10”. In the example we work with, I right-click on the Field header. You can also right-click on other cells within the Field. Within the context menu that Excel displays, select “Field Settings…”. The Custom Name input field is on the upper section of the Field Settings dialog. This is where you can specify the Field name you want to use. In the example we're working with, I enter “Months”. After you've entered the new Field name, click OK to confirm the changes. The OK button is on the lower right section of the Field Settings dialog box. Once you complete the easy 6-step process I describe above, Excel changes the Field name. The screenshot below shows the results in the Pivot Table I use as example. Notice how the new name (Months) appears in both the Pivot Table and the Pivot Table Fields task pane. In this section, I explain all the details of how you can change a default Field name using the Ribbon or a keyboard shortcut. As an example, I work with the following Pivot Table. This report is the result of automatically grouping date Fields using the process I describe in a previous section. Notice how the Field holding quarters is labeled “Date” by default. In the following sections, I show you how I change that default label to “Quarter”. Begin the process by selecting a cell in the Field whose name you want to modify. In the following screenshot, I select the Field header (Date). You can also select other cells within the same Field. The Ribbon has a PivotField Name input field. You can find this under Ribbon > Analyze > Active Field. You can also get to the PivotField Name input field by using the keyboard shortcut “Alt, JT, M”. Type the new Field name in the PivotField Name input field. Confirm your entry by pressing the Enter key. In the example below, I enter “Quarter”. Because of the process above, Excel updates the Field name. The following screenshot shows the results I obtain in the Pivot Table example. Notice the new Field name (Quarter) in the Pivot Table, Pivot Table Fields List and Rows Area. In this section, I go through a third method of changing a default Pivot Table Field name. As an example, I use the following Pivot Table report. This is the result of manually grouping Items using the process I describe in a previous section. Notice the default name (Item2). In this example, I select the cell with the Item2 Field name. Type a new name to replace the Field name. Modify the Field name in the Formula bar. Once you complete this simple process, Excel modifies the name of the Field. In the screenshot below, you can see the new custom Field Name (Category instead of Item2). In addition to changing the default names of the Fields that result from grouping, you can modify the default names of the groups themselves. Select a cell containing the group name. In the following sections, I explain these 2 simple steps. As an example, I work with the following Pivot Table report. This is the same report that appears in the screenshot above. Notice the group names (“Group 1” and “Group 2”). To change the default name of a Pivot Table group, start by selecting the cell. In the example we're working with, I separately select the cells of both Group1 and Group2. Simply type a new name to replace the default one. Press the “F2” keyboard shortcut to edit the cell. Modify the name of a group in the Formula bar. Surface: Previous Group1, composed of the Surface Book, Surface Pro 4 and Surface Studio. Xbox: Previous Group2, composed of the Xbox One and Xbox One S.
Right-click on an Item within the group you want to ungroup. If you want to ungroup a manually-grouped Field, right-click on the Field header. Select 1 of the items within the group. To entirely ungroup a manually-grouped Field, select the Field header. Go to Ribbon > Analyze > Ungroup. Alternatively, use the keyboard shortcuts “Shift + Alt + Left Arrow”, “Alt, JT, U” or “(Shift + F10), U”. Date/Time Or Numeric Fields: If you ungroup a group within a date, time or numeric Field, Excel generally removes all grouping for that Field. 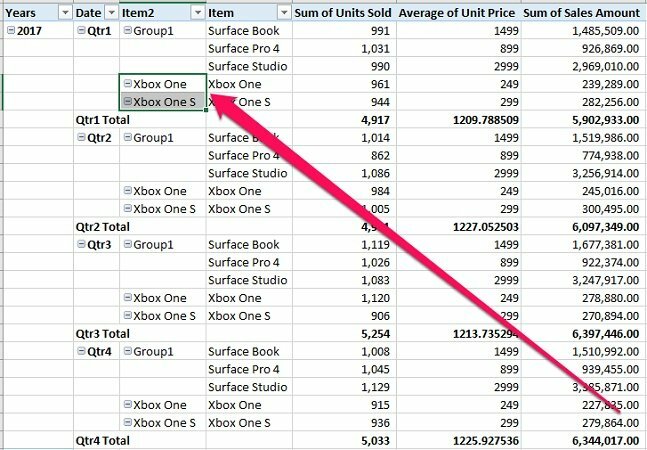 Manually-Grouped Items: If you ungroup a group of manually-grouped Items, Excel generally ungroups the Item(s) you've selected. Therefore, the Field that Excel created when you manually group items doesn't disappear until you ungroup all groups within that Field. If you work with Excel 2016 and take advantage of the time grouping feature that I explain in a previous section, there's an additional consideration: the effects of undoing (“Ctrl + Z” keyboard shortcut) after time grouping is triggered. You add a date or time field to the Rows or Columns Area of a Pivot Table report. This triggers time grouping. Excel automatically groups Fields because of the time grouping feature. The first time you undo, Excel removes the grouping. This results in the removal of the calculated columns or rows the time grouping featured added. Therefore, the only Field left is the one you originally added. In other words, this first undo only undoes the time grouping (#2 above). The second time you undo, Excel removes the date or time field you originally added in step #1 above. This second undo is the one that undoes everything within this process. Move the Date Field from the Pivot Table Field List into the Rows Area. Press the Undo command 1 time. Press the Undo command a second time. As I explain above, this is the single step you take to automatically group date or time fields in an Excel 2016 Pivot Table. As expected, this triggers time grouping. 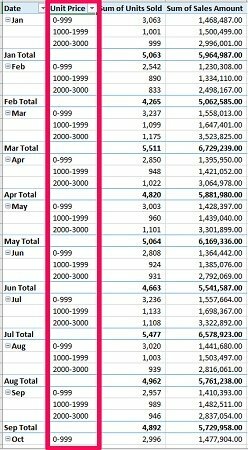 Notice how Excel displays the data grouped by year, quarter and month. The first time you undo, Excel undoes the automatic grouping. The Date Field continues to appear within the Rows Area in the Pivot Table report. However, notice that the data is organized by individual days (vs. higher-level periods such as month). The second time you undo, Excel removes the date Field (added in step #1 above) from the Pivot Table. In other words, the whole process is undone. Report #1: Date Field is grouped by quarters and years. I use this report in example #2 below. Report #2: Unit Price Field is grouped in $1,000 intervals. This is the report I use in example #3 below. In the following sections, I go through each of the steps required to ungroup these Fields both manually and with the applicable keyboard shortcut. In this section, I explain the process to ungroup a Field using a contextual menu. The Item you right-click on depends on the group you want to ungroup. In the example we're looking at, I can right-click on any Item within the Years or Quarters Fields. After you right-click on a Pivot Field Item, Excel displays a contextual menu. Within the contextual menu displayed by Excel, choose “Ungroup”. After you select Ungroup, Excel usually removes all grouping for the automatically-grouped Field. In the Pivot Table report example, the results look as follows. Notice how a single call to the ungrouping command results in the removal of the groupings in years and quarters. In this section, I show how you can easily ungroup a Pivot Table Field through the Ribbon or using a keyboard shortcut. The Item you select depends on the group you want to ungroup. In this example, I can select any Item within the Unit Price Field. Go to Ribbon > Analyze > Ungroup. Use a keyboard shortcut such as “Shift + Alt + Left Arrow”, “Alt, JT, U” or “(Shift + F10), U”. Create a new Field, named “Category”. Group all Microsoft Surface Items under the Surface category. Group all Microsoft Xbox Items under the Xbox category. Ungroup all Items within the newly-created Field. In the following sections, I show how both ungrouping methods. Right-click on the Field header. Go to Ribbon > Analyze > Ungroup, or use a keyboard shortcut (“Shift + Alt + Left Arrow”, “Alt, JT, U” or “(Shift + F10), U”). Let's look at the basic 3-step process to ungroup a manually-grouped Field. I illustrate the steps in the second process in the following section. To ungroup a manually-grouped Field, start by right-clicking on the Field Header. You can also use the keyboard shortcut “Shift + F10”. In the example below, I right-click on the Category Field header. Because of step #1 above, Excel displays a contextual menu. Within the contextual menu, choose Ungroup. The following image shows the results I obtain in the case of the Category Field. Notice how, as expected, Excel has eliminated the whole Field from both the Pivot Table report and the Field List. Right-click on an Item within the group you want to ungroup. Select an Item within the group. Use the keyboard shortcut “Shift + Alt + Left Arrow”, “Alt, JT, U” or “(Shift + F10), U”. Let's go through the 3 steps of the basic process to ungroup a single manually-grouped group of Items. In the example below, I ungroup the Items within the Surface group in the Pivot Table below. If you're ungrouping manually-grouped Pivot Table Items, you must click on 1 of the Items within the relevant group. For example, as I explain above, I only ungroup one of the groups: Surface. Therefore, I right-click 1 of the Items within this group. After right-clicking on an Item within the applicable group, Excel displays a contextual menu. To confirm that you want to ungroup the Items, select Ungroup. Excel only ungroups the selected group (Surface). When you create a Pivot Table, Excel generally makes a copy of the entire source data. This data is stored in a memory area known as the Pivot Cache. By storing the data in the Pivot Cache, Excel creates an additional copy of the source data. Even though this has some practical advantages, it uses up memory and increases the size of your files. If you create several Pivot Tables based on the same source data, but each working with a separate Pivot Cache, your workbook may be bloated and slow due to the amount of (repeated) data. Each time you create a new pivot table in Excel 2016, Excel automatically shares the pivot cache. Pivot Cache sharing has several benefits. Most notably, as I mention above, it reduces memory requirements and file size vs. the scenario where the Pivot Cache isn't shared. Pivot Tables that share the same Pivot Cache also share the same Field grouping settings. In other words, if you work with several Pivot Tables that share a Pivot Cache and you group certain Fields in any of those Pivot Tables, those grouping settings affect (and apply to) that same Field in all the other Pivot Tables. Therefore, if you have several Pivot Tables and want to apply different Field-grouping criteria, you want to avoid sharing the Pivot Cache. If your Pivot Tables are based on different source data, you don't have to worry about the Pivot Cache sharing issue I describe above. In such cases, the Pivot Tables can't share the Pivot Cache. Pivot Tables based on different sources of data use different Pivot Caches. Copy and paste a previously existing Pivot Table into a different workbook and back to the original workbook. Use the Pivot Table Wizard to create the Pivot Table. Use different range names for the source data. The most appropriate method of forcing Excel to create separate Pivot Caches generally varies depending on the situation you're in. There are other ways (in addition to the 3 I explain here) to achieve this same objective. Copy an existing Pivot Table. Paste the Pivot Table in a separate (helper) workbook. Modify the grouping settings of the Pivot Table in the helper workbook. Copy the Pivot Table from the helper workbook. Paste the Pivot Table in the original (source) workbook. The keyboard shortcuts “Ctrl + A”, “Ctrl + *”, “Ctrl + Shift + Spacebar” or “Alt, JT, W, T”. Go to Ribbon > Analyze > Select > Entire Pivot Table. The keyboard shortcuts “Ctrl + C”, “Ctrl + Insert”, “Alt, H, C, C” or “(Shift + F10), C”. Go to Ribbon > Home > Copy. When selecting the Pivot Table you want to copy, make sure that it's based on the source data you want the new Pivot Table to use. The keyboard shortcuts “Ctrl + N” or “Alt, F, N”. Go to Ribbon > File > New. The keyboard shortcuts “Ctrl + V”, “Alt, H, V, P” or “(Shift + F10), P”. Go to Ribbon > Home > Paste. I explain several ways of specifying Pivot Table grouping settings throughout this Tutorial. You can, basically, specify the grouping settings of your new Pivot Table here without influencing the Pivot Table that you originally copied. Use a keyboard shortcut, such as “Alt + F5”, “Alt, A, R, R”, “Alt, JT, F, R” or “(Shift + F10), R”. Closing and opening the source workbook. Excel MVP Gašper Kamenšek reports that, sometimes, you don't even need to close the workbooks. Expand the selection to the whole Pivot Table. Use a keyboard shortcut, such as “Ctrl + V”, “Alt, H, V, P” or “(Shift + F10), P”. The result of the process is that the newly-pasted Pivot Table has its own separate Pivot Cache. Select a cell within the source data. Use the keyboard shortcut “Alt, D, P”. Excel displays the Pivot Table Wizard. In Step 1 of 3 of the Pivot Table Wizard, click Next. In Step 2 of 3 of the Pivot Table Wizard, confirm the Range of your source data and click Next. Excel displays a dialog box indicating that you can use less memory if the new report is based on the previously-existing Pivot Table report. In Step 3 of 3 of the Pivot Table Wizard, specify where you want to put the Pivot Table report and click Finish. You can select your source data in Step 2 of 3 within the Pivot Table Wizard (step #5 below). However, if you select a cell within the source data prior to launching the Pivot Table Wizard, Excel is usually able to select the entire range of your source data by default. The Pivot Table Wizard isn't in the Ribbon (by default). You can customize the Ribbon to add the command. However, in any case, you can access the Pivot Table Wizard with the keyboard shortcut “Alt, D, P”. Data Source: Microsoft Excel list or database. Kind of Report: Pivot Table. These settings are usually appropriate. Therefore, you can generally click on Next button on the lower right side of the dialog box. In the second screen of the Pivot Table Wizard, you're asked about the location of the source data you want to use. As I mention in step #1 above, Excel should determine the range automatically. If there are any mistakes, you can correct them. Once you're sure that the range is correct, click Next on the lower right side of the dialog box. If the workbook you're working on has a previously-existing Pivot Table report based on the same source data, Excel displays a dialog box. This dialog explains that your new Pivot Table report uses less memory if you base it on your existing report, which was created from the same source data. This means, as I explain above, that you can reduce the memory required by sharing the Pivot Cache between the Pivot Tables. Yes: Results in the Pivot Tables sharing the Pivot Cache. As explained in the dialog box (and above), this results in lower memory requirements and smaller file size. No: Results in Excel creating a separate Pivot Cache. Since you don't want to share the Pivot Cache between the Pivot Tables, select No. Once your choice is selected, click Finish on the lower right corner of the dialog box. After you complete the 8 steps above, Excel creates a new Pivot Table report. This Pivot Table has its own (unshared) Pivot Cache. The examples for the 2 methods to create separate Pivot Caches I explain above show the process for creating new Pivot Tables. In this section, the example and description explain how to force Excel to create separate Pivot Caches for Pivot Tables that already exist. You can, however, use certain variations of these 3 processes to force Excel to separate Pivot Caches when (both) (i) creating a new Pivot Table, or (ii) modifying an existing Pivot Table. Select the source data range. Define a name for the source data range. Repeat step #2 as required. You want to have 1 name per required Pivot Cache. Change the defined name every time. Select 1 of the Pivot Tables based on the source data you selected in step #1. Within the Change PivotTable Data Source dialog, enter one of the newly-defined names in the Table/Range input field. Repeat steps #4 to #7 for each Pivot Table that needs a separate Pivot Cache. Change the defined name you use as source every time. Let's go through each of these 10 steps in more detail. In the example that I show below, I work with 2 Pivot Tables. As I mention above, you may apply this process to more Pivot Tables. Select a cell within the source data range. Use the New Name dialog box. Click the Name box. This box is usually located on the upper left section of the screen. Substitute the existing name with a new one. For example, in the screenshot below, I enter “sourcePivotTable1”. Press the Enter key to confirm the change. After you complete the process above, Excel defines the new name and assigns it to the selected data range. Use the keyboard shortcuts “(Ctrl + F3), (Alt + N)” or “Alt, M, M, D”. Go to Ribbon > Formulas > Define Name. Excel displays the New Name dialog box. Confirm that the scope of the name is “Workbook” and the range to which the name refers to is correct. Enter a new name in the Name input field and click OK. In this example, I assign the name “sourcePivotTable2”. Excel displays the Name Manager dialog box. Click the Close button in the lower right corner of the Name Manager dialog. After you go through the 6 steps above, Excel creates the name and assigns it to the range. Under this method, you get Excel to create a new Pivot Cache by defining different names for the same data range. You then use those different names as the sources for the Pivot Tables. Therefore, you must have 1 defined name for each Pivot Cache. To achieve this, repeat step #2 above as many times as required. Once you've created the defined names you need, you can assign them as a source for existing Pivot Tables. To begin this process, select a cell within 1 of the Pivot Tables that needs a separate Pivot Cache. Enter 1 of the newly-defined names in the Table/Range input field of the dialog box. In this example, I enter “sourcePivotTable1”. Once you've entered the appropriate defined name as source, click the OK button on the lower right section of the dialog box. You force Excel to create separate Pivot Caches by using the different defined names to specify the source of each Pivot Table. Therefore, you must repeat steps #4 to #7 above for all the affected Pivot Tables. Once you go through the steps I explain above, each of the Pivot Tables whose data source you modify will have a separate Pivot Cache. In other cases, you may want to group certain Items and notice that the Group Selection or Group Field buttons (in Ribbon > Analyze) are greyed-out (disabled). The Field contains blank records. Data within the Field is of different types. A typical case is having text within a date/time or numeric Field. The source data must not have empty columns or rows. All the cells within a column must be of the same data type. Let's look at these 2 scenarios. I also discuss some other options you can explore if blanks or data type inconsistencies aren't the cause of the cannot group that selection error or the greyed-out grouping buttons. As I mention above, a common best practice is to avoid working with source data that has empty rows or columns. This implies that, when possible, you should have as few blanks as possible. Blank cells are generally errors waiting to happen. The solution to a cannot group that selection error or greyed-out group buttons caused by blanks is (not surprisingly) to fill in the blank cells. There are cases where determining the data you use to fill the blanks is easy. In those situations, you can simply enter the appropriate value in the blank cell. There are other situations where you may have a harder time figuring out which value to use. For these cases, consider using a dummy value. The idea is of a dummy value is to have a missing value code that has some logical meaning. If necessary, you can usually filter the dummy values out. Inappropriate Field formatting can be the cause of several Pivot Table issues, including grouping problems. Go back to your source data. Make sure that all the data within the column(s) that serve as source for the Field(s) you want to group is of the same type. Having text within a value Field. You have text data within a value Field. Excel interprets a value as text. If you have text data within a value Field, the solutions is simple: replace the text data with numerical data. If Excel is interpreting values a text, there are several ways to solve the problem. Convert text-formatted digits to number using Excel VALUE function and other options, at AbleBits. Convert Text to Numbers in Excel, at Excel Unplugged. Converting Forced Text to Numbers, at Allen Wyatt's ExcelTips Ribbon Interface. Fix Excel Numbers That Don't Add Up, at Contextures. You may encounter some (rare) cases, where the cannot group that selection error or the greyed-out group buttons aren't caused by (i) blank cells, or (ii) inconsistent data types within a Field. In such situations, the solutions I explain in the previous sections may not work. Ensuring your data and Pivot Table meet the applicable conditions for grouping. You're trying to “group” a single Item. This can theoretically happen when you're working with manual grouping of Items. If you choose a single Item (vs. selecting several) prior to executing the Group command, Excel cannot group the selection. The solution is to make sure that you select several Items to group. You're trying to group Fields that aren't in the Rows or Columns Areas of the Pivot Table. Move the Field to the Rows or Columns Area. Group the Items within the Field, using the methods I describe in previous sections. Move the Field back to the Area (Filters or Values) where you want to display it. You're trying to group Fields that are at different levels. This may occur when Fields are organized in levels (for example City and Region) and you try to manually group Items from different levels. Generally, Excel is only able to group Items at the same level. You're trying to group a Field that's already grouped. Depending on the applicable grouping settings and organization of the Pivot Table report, you may be trying to group in a way that Excel can't handle. In these cases, check your Field List and the Pivot Table Areas. If there are unnecessary grouped Fields, ungroup them before trying to group again. In some cases, the grouping causing the issue may be at the source data. Therefore, you may also want to check the source table. You're trying to use the Group Field command on Fields that aren't suitable for automatic grouping. As I explain in the section about automatic grouping, Fields must usually be date/time or numeric for you to use this feature. The Group Field button (Ribbon > Analyze > Group Field) applies to this type of Fields. If you're trying to group Fields that aren't date/time or numeric, the Group Field button is generally greyed out. In these situations, you can generally apply manual grouping by following the easy process I describe in a previous section. Microsoft introduced the time grouping feature in Excel 2016. You may, however, prefer disabling this feature. In this section, I explain how you can do it. Stand-Alone Excel 2016: As of the time of this writing, you can only turn off time grouping manually. Office 365 Excel: You can turn off time grouping from the Excel Options dialog. As I'm writing this post, the only way to turn off time grouping in a stand-alone version of Excel 2016 is by adding a new key to the Windows Registry. The process of adding this registry key is explained by Microsoft here. According to the comments of Dan Battagin (from the Microsoft Excel Team) at Excel User Voice, Microsoft may add the possibility to turn off time grouping from the Excel Options dialog (which I explain below) to the stand-alone version of Excel. I suggest you check the status to confirm whether the feature has been added. Making changes to the Windows Registry is a sensitive matter. Certain incorrect editions may damage your operating system. Check out, for example, the warning Microsoft makes at the beginning of the explanation of how to add the new registry key in the webpage I link to above. If you choose to edit the registry, make sure to take any necessary precautions prior to doing it. This includes backing up the Registry and valuable data prior to making the modifications. Open the Excel Options dialog box. Go to the Advanced tab of the Excel Options dialog. Within the Data section of the Advanced tab, select the option to disable automatic grouping of date/time columns in Pivot Tables. Go the File tab of the Ribbon, and select Options on the left side of the screen. Use the keyboard shortcuts “Alt, F, T” or “Alt, T, O”. Once you're within the Excel Options dialog box, select the Advanced tab on the left side of the dialog. The contents of the Advanced tab are divided in several sections. One of the last sections is Data. Within the Data section, you can find the setting to Disable automatic grouping of Date/Time columns in PivotTables. Click the box on the left side of this option to add a checkmark. To confirm your settings, click the OK button on the lower right side of the Excel Options dialog. Once you complete the quick 4-step process above, Excel disables time grouping. The image below shows an example of how this looks like. Notice that, after I add the Date Field to the Rows Area of the Pivot Table, Excel doesn't time group the newly-added Field. Compare these results with those I show in the example within the section on how to automatically group date or time Fields in an Excel 2016 Pivot Table. If you work with OLAP sources, there are some grouping limitations to be aware of. You can't group Items for an OLAP “source that doesn't support the CREATE SESSION CUBE statement”. Even if the CREATE SESSION CUBE statement is supported, you may want to avoid using it due to the disk usage issues this can generate. For further information, I suggest you read Microsoft MVP Chris Webb's posts here, here and here. Use the Convert to Formulas command. You can't create Slicers for an OLAP hierarchy that has grouped Fields. After reading this Pivot Table Tutorial, you have the knowledge to easily group or ungroup data in a Pivot Table. You can do this in different contexts and with different types of data. You've also read about the time grouping feature that Microsoft added in Excel 2016. If you don't like this feature, I explain how you can disable it. We've also gone through several common problems that arise when trying to group Pivot Table Fields. The information and examples provided in that section allow you to handle and troubleshoot the most common grouping problems. Finally, I include a basic introduction to the limitations when grouping Items in Pivot Tables based on OLAP sources. Remember that you can get immediate free access to the Excel workbook example that accompanies this Pivot Table Tutorial by subscribing to the Power Spreadsheets Newsletter. Excel 2016 Pivot Table Data Crunching.